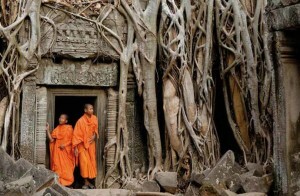 Steeped in culture and natural beauty, it is no surprise that Vietnam has eight UNESCO Heritage Sites. See the best of these world-famous landmarks during an insightful two-week holiday. From the world’s biggest cave to Hue’s imposing Imperial Citadel, this two-week holiday is guaranteed to create lasting memories. Upon arrival to Hanoi, our guide and driver will be waiting to provide transport to the hotel for check in. After checking in, enjoy the remainder of the afternoon/evening free at leisure. The rest of day is at your leisure. 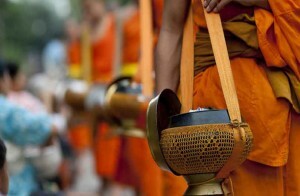 Begin the day with a departure for the Temple of Literature, Vietnam’s first university. Built in 1076, the Temple of Literature was established within a temple to educate Vietnam’s royalty, mandarins and members of the elite. The university functioned for an incredible 700 years and its gardens and well-preserved architecture offer a fascinating glimpse into Vietnam’s past. Next pay a visit to Hanoi’s UNESCO World Heritage Site, the Thang Long Imperial Citadel. Dating back to the 7th century, the historical site reflects the fusion between Chinese and Champa influences. 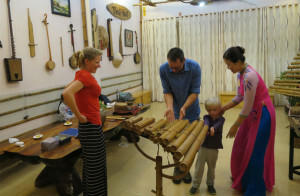 The tour continues along to Hanoi’s picturesque West Lake area and the 6th century Tran Quoc Buddhist Pagoda. From here, transfer (or stroll along the lakeside) 700 meters to the nearby Taoist temple of Quan Thanh. Wrap up the day with a visit to Hanoi’s Old Quarter. Take a walking tour through charming Hang Be Market and around Hoan Kiem Lake, a bustling area home to thousands of small businesses and shops. Wrap up the day with a Water Puppet show, a uniquely North Vietnamese art form depicting scenes from rural life and episodes of national history. Depart in the morning (08:00) for the 2.5-hour drive through rural northern Vietnam to the site of Vietnam’s first capital, Hoa Lu. Visit the temples dedicated to Emperor Dinh Tien Hoang of the Dinh Dynasty (968-80), and Emperor Le Dai Hanh of the Le Dynasty (980-1009). After visiting Hoa Lu (if time permits), there is an optional half-hour walk up one of the surrounding limestone formations. The views from the summit of the hill are spectacular. In the late morning depart for Tam Coc Town for a Vietnamese lunch, stopping for some photos of the villages and landscapes along the way. After lunch, visit Trang An Landscape Complex which was listed on UNESCO World Heritage Site in June 2014. Take a relaxing boat ride on a peaceful river passing through a series of caves (one which takes 15-minutes to pass through in darkness). Trang An is a spectacular landscape of limestone karst peaks permeated with valleys, some of which are submerged, and surrounded by steep, almost vertical cliffs. As the boat gently slices through the water, take note of the enormous limestone karsts jutting out from the green rice fields giving rise to other name, ‘Halong on Land’. For the adventurous sort, climb up to Bich Dong Pagoda on nearby Ngu Nhac Mountain, dating back to 1428 and comprising three structures: Ha, Trung, and Thuong Pagodas. After that, take a boat trip back by sampan to Tam Coc town. Transfer to the hotel and the rest of the afternoon is at leisure. Following breakfast, depart on a visit to the remote and less visited Ho Citadel, which was declared a UNESCO World Heritage site in 2011, situated in nearby Thanh Hoa Province. Ho Citadel’s remains consist of the Inner Citadel, La Thanh Outer Wall and the Nam Giao Altar, which are designed for a centralized imperial city in order to show a concept of royal power. The use of large stone walls with traditional feng shui principles are the main characters that represent the almost intact Ho Citadel. Enjoy a Vietnamese lunch after the visit and transfer back to the hotel, stopping for photo opportunities along the way. Enjoy the remainder of the day at leisure. Relax and enjoy the facilities at the hotel, take a walk or bicycle ride through the rice paddy fields that surround the hotel or, if time permits, make an optional trip to Cuc Phuong National Park (surcharge payable) – Vietnam’s first national park that was established in 1962. Following an early breakfast, leave Ninh Binh for the 4-hour drive to Halong Bay, perhaps Vietnam’s most famous and most popular UNESCO World Heritage site! 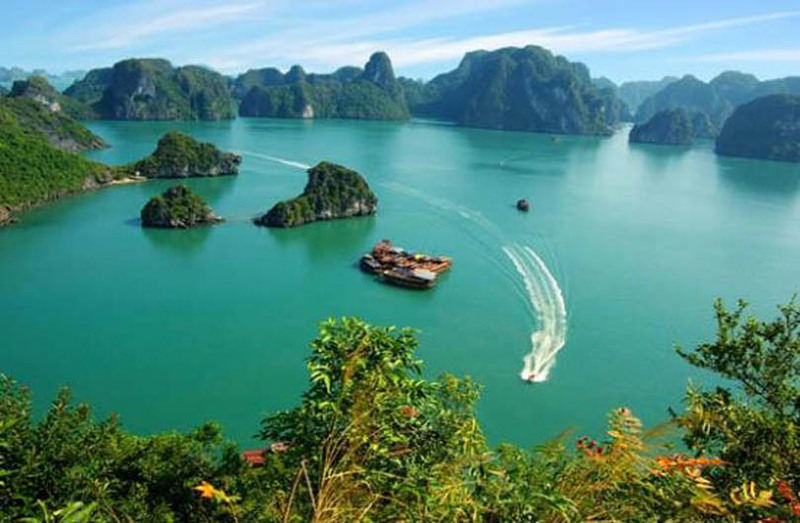 The name ‘Ha Long’ means the dragon descending into the sea and owes its origins to a Vietnamese myth. The towering limestone karsts represent the dragon’s back, surrounded by jade green water creating an unforgettable site. There are more than 1600 limestone islands and islets with different shapes jutting out from the sea. 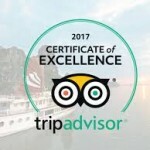 Arrive at the Halong Bay jetty around noon and proceed with check-in formalities before boarding a boat for the unforgettable overnight cruise on Halong bay. After a welcome onboard, lunch will be served while cruising towards the bay. In the afternoon, enjoy some sightseeing, onboard activities or simply spend some time relaxing on board. Towards the end of the day the boat sets anchor for the night among the karst formations. Dinner is served on board. 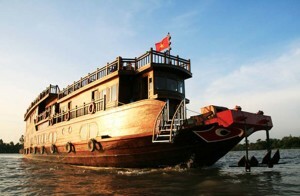 Overnight on board the boat in Halong Bay (private cabin on-board the join-in boat cruise). Enjoy the tranquil morning in the middle of the Bay as the sun rises on Halong. Breakfast is served (brunch on some boats) while the vessel cruises slowly through the magnificent rock formations and back towards port. Mid-morning the boat will return to shore. Disembark and transfer to Hanoi Airport for the mid-late afternoon flight to Danang in Central Vietnam. Upon arrival to Danang, our guide and driver will be waiting to provide the 35-minute transfer to nearby Hoi An. Hoi An was a major Asian trading port from the 15th to the 19th centuries. Its architecture and relaxed lifestyle have changed little over the years making it a favourite destination for international visitors. The ‘Hoi An Ancient Town’ was declared a UNESCO World Heritage Site in 1999. Reach My Son in the late morning hours. Stop to have lunch in a local restaurant before setting off on foot to the ruins of My Son. Venture around the paths, visiting the numerous ruins and soaking in the atmosphere of this historic site. Mid afternoon begin the drive back to Hoi An along different back roads that run parallel to the Thu Bon River. The afternoon light casts a different hue on the farms, water and roads, great for photos or as a scenic backdrop for the jeep ride. Reach Hoi An just in time for a sunset walking tour. Despite the passing of 200 years and the ravages of weather and war, the centre of Hoi An remains mostly unchanged by the hands of time. This walking tour is the best way to explore this UNESCO World Heritage Ancient Town with its wooden-fronted merchant houses, Japanese Covered Bridge, open-air market and range of shops and galleries. After the tour, enjoy strolling around town, have some clothing tailor-made or simply relax along the enchanting riverside lit up by thousands of lanterns at night. Get acquainted with Vietnamese culture through the art of Vietnamese cooking during a cooking class. This 4-hour experience combines a market tour, an overview of ingredients common in Vietnamese food, and a hands-on cooking class that ends with each participant making their own multi course meal. The day begins with an 08:30 pick up from the hotel. Start with a 1-hour tour of the Hoi An central market, learning how to select the freshest ingredients. Return to Morning Glory, where a lovely air-conditioned room with individual cooking stations will be used for the cooking class. Here, each dish is made step by step in an interactive process. Staff is always available to assist with the experience. The class not only covers cooking techniques, but also herbal remedies and tricks to use Vietnamese vegetable graters and knives. All efforts are rewarded with the lunch that has just been prepared. After the cooking class, depart Hoi An for the 3-hour drive along the Hai Van Pass to Hue, the former citadel of the very last Nguyen Dynasty. Upon arrival in Hue, check in at the chosen hotel and take some time to relax. Dishes vary based on the seasonal availability of fresh ingredients. Note: Cooking Class is non-private (so join-in basis), with a minimum 06 persons required to operate. Private classes are available on request with surcharge payable. This morning after breakfast, depart from the hotel in Hue for a city tour exploring the UNESCO World Heritage listed ‘Complex of Hue Monuments’. Begin with the Imperial Citadel, where the Nguyen Dynasty ruled between 1802 and 1945. The ancient citadel reflects the pomp and ceremony of the dynastic rulers as well as the scars of many years of turmoil, both ancient and modern (the Royal Citadel was badly damaged in the latter stages of the war). From here take a cyclo through dai noi ‘Old City’ to Tinh Tam Lake where Emperors used to come to relax. Continue to visit Thien Mu (Celestial Lady) Pagoda overlooking the Perfume River. Constructed in 1601, the 21-meter tall tower is the centerpiece of the pagoda and represents seven reincarnations of the Buddha. In the grounds of the pagoda is the Austin car made famous from the resident monk who drove the vehicle to Saigon to protest against the southern regime. The photo of his self-immolation was captured and is one of the most well-known images of the war. Enjoy lunch at a local restaurant featuring an authentic Hue style cuisine. In the afternoon visit the tomb of the former emperor Minh Mang which is located in a tranquil setting of gardens and ponds. If time permit, journey on to Khai Dinh’s Tomb, one of the most unique in Hue. On the way back to Hue, visit the 19th century Ho Quyen (tiger arena), which held yearly battles between elephants and tigers. Before heading back to the hotel, take time to stroll around Dong Ba Market with the guide. This morning after breakfast, transfer from Hue to Dong Hoi. Stop at a couple of historic sites and monuments to understand the history of the Vietnam War. Continue up Highway 1 across the Hien Luong Bridge and over the Ben Hai River, which demarcated North and South Vietnam- this area saw some of the heaviest fighting during the war. 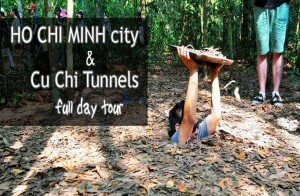 The journey from here to the Vinh Moc Tunnels is scenic after leaving the main highway, passing through quaint villages and skirting along Cua Tung Beach. The village of Vinh Moc found itself tragically positioned in one of the most heavily bombed areas of Vietnam. In order to escape this bombardment, the villagers constructed approximately 2.8 km of underground tunnels which they used as a refuge to survive the bombings. From Vinh Moc drive to Truong Son National Cemetery where the remains of some 15,000 Vietnamese soldiers and civilians have been laid to rest. Drive back to Dong Hoi for an afternoon arrival. Check in to the hotel and enjoy the remainder of the day free at leisure. After breakfast, transport will be provided from the hotel to Phong Nha – Ke Bang National Park, which was declared a UNESCO World Heritage Site in 2003. The National Park contains and protects over 104 km of caves and underground rivers making it one of the most outstanding limestone karst ecosystems in the world. The karst landscape is not only complex but also ancient, reaching back more than 400 million years. On arrival to Phong Nha, visit the Paradise Cave, one of the larger and most impressive accessible caves in the area. After a 400 stair climb, the entrance to the cave comes into sight. Descend into the cave on a wooden walkway, which continues for 1 km through the enormous, well-lighted cave. After the visit, enjoy lunch at a local restaurant. After lunch board a private boat for the 2.5 km leisurely boat trip down the Son River to the mouth of the Phong Nha cave. Pass by the entrance to the ‘Cave of Teeth and Wind’ and enter the mystical tunnels, filled with giant stalactites and stalagmites and crystal clear waters. The area has numerous grottoes and caves; so far only 20 caves with a total length of 70km have been surveyed. Late in the afternoon, transfer back to the hotel in Dong Hoi city, and the evening is free at leisure. This morning after breakfast transfer to Dong Hoi Airport for the flight south to Ho Chi Minh City. Upon arrival in Ho Chi Minh City, our guide and driver will be waiting to provide transport to the hotel for check in. In the afternoon, join a city tour to unveil the history and stories behind this vibrant southern metropolis. The first visit of the program is to the Reunification Hall, formerly known as the Presidential Palace, followed by some of the colonial visits of the city: the Old Saigon Post Office, Dong Khoi Street (formerly Rue Catinat), Continental Hotel, Opera House and City Hall. After this historical wander, continue to the War Remnants Museum where exhibition halls display imagery from both the French and American wars. Continue to the Jade Emperor Pagoda, located on the fringes of District 1. Dating from 1909 and built by Cantonese Buddhists, this quiet oasis was designed using feng shui principals showcasing ornate statues and effigies. After the visit, return to the hotel for the remainder of the day at leisure. After a light breakfast, embark on an exciting street food tour in the city. During this half day morning tour, travel on the back of a motorbike to experience the hidden parts of Ho Chi Minh City, sampling some delicious street food accompanied by a Vietnamese chef. Walk around the vibrant and colorful wet market early in the morning to experience local life and to taste some of the favourite local delicacies. The chef will explain how each selection is prepared and the culinary patterns of Vietnamese food. In addition to sampling delicious food, riding on the back of a motorbike is an unforgettable means of exploring the city. Around 12:15, the motorbike driver will provide transport back to the hotel in the afternoon. This evening, join a relaxing dinner cruise on board the elegant Lady Hau cruise on Saigon River. Pick up will be sorted from the hotel to the pier, and welcome drinks will be waiting on board. Relax at the open lounge area in the front of the boat while cruising along the Saigon riverside. Enjoy a delicious buffet and BBQ, taking some time out to soak up the atmosphere of Vietnam’s busiest city. This 3-hour dinner cruise is the perfect way to finish a hectic day in the city. After the dinner cruise, transport will be provided back to the hotel. Note: Secret Street Food Tour with Chef and Dinner Cruise are non-private (join-in basis). Private tours are available upon request with surcharge payable. Enjoy the morning at leisure until transport (provided) to Tan Son Nhat Airport for the onward flight.